Alarmed residents are crying foul days after they were assured seawater and air quality were up to standard following a chemical leak in the southeastern Chinese province of Fujian. 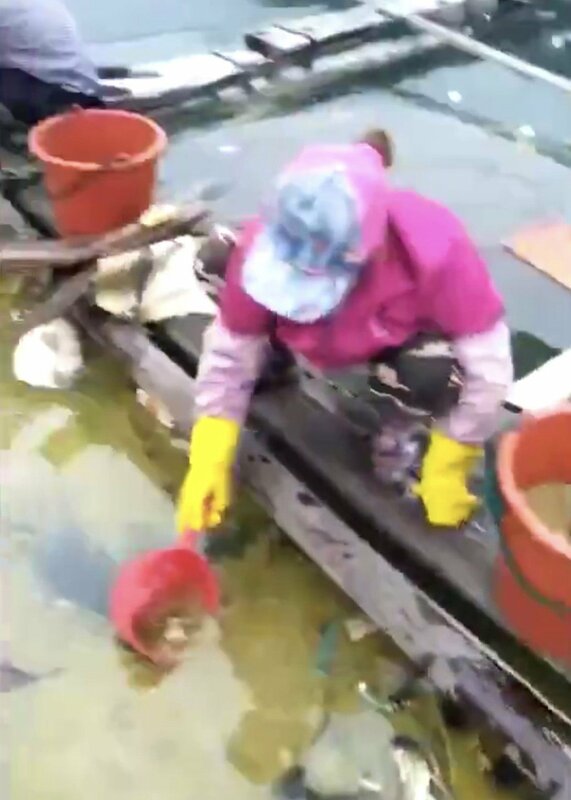 Locals say there is still a strong odour in the air and oil stains in the fish farms of Quanzhou’s Quangang district in eastern Fujian and they are accusing officials of a cover-up. The contamination occurred in the early hours of Sunday morning when residents were woken by a strong odour – “like stinky paint or something that burned for a long time”. They were told later that day that nearly seven tonnes of C9 aromatics from the neighbouring Fujian Donggang Petrochemical Company had leaked during transfer between the wharf and a vessel when the connecting tube broke. Concern soon turned to anger when assurances from the local environmental authorities failed to match what people in the area were experiencing. On Sunday evening the Quangang District Environment and Protection Bureau advised that treatment of the contaminated area of the sea was “basically complete” and volatile organic compounds – a range of chemicals including some which are detrimental to health – were within safe levels. Two days later, the bureau announced the water quality was now suitable for fish farming. “They were lying through their teeth,” said one fisherman from Xiaocuo village, next to the site of the leak and also the most severely affected area. “Yellow oil stains are still visible in fish farms this morning and the skimmers for absorbing oil were still scattered around in the sea. “The air still smelled disgusting,” said the fisherman, who identified himself only by his family name of Xiao. He said he had stayed indoors all day because of the strong smell and sent his two children away to Quanzhou city. He also said some neighbours, who rushed to save their fishing raft immediately after the incident, fell ill and had to be taken to hospital. “I wore gloves to touch the water, or my skin would peel off,” Xiao said. Pupils at Xiaocuo Village Primary School were asked to attend school, even with masks on, but angry parents had been demanding the schools close, he said. A photo of an attendance sheet from the primary school shows some children have stayed home with symptoms including headaches and vomiting. Vivian Wang, a teacher in the centre of Quangang district, about 10km (six miles) away from the sea, said she was angry there was so little media coverage, but she was especially angered by the announcement that air quality had improved. “At one site monitored by the environmental protection bureau, we saw water being sprinkled on it to improve the water quality. This data is not convincing,” Wang said. In an interview with The Beijing News, an unidentified bureau official said the water was sprinkled to tackle the dust from a nearby construction site, not to improve the air quality data. But what worries fishermen most is their financial losses as a result of the leak. “My parents lost about 2 million yuan (US$288,500) worth of abalone because the fishing rafts were eroded and sank, and our farm was only a mid-sized one,” said Xiao Min, daughter of a fish farmer who did not want to be named. The Quangang Bureau of Agriculture, Forestry and Fishery has banned fishing since Sunday until water quality analysis is complete. The port city of Xiamen has also banned the sale of fish products from Xiaocuo village. The fishermen said they were losing thousands of yuan every day. Fisherman Xiao said that, even though he fishes in the deep sea, there were no takers for his product. “I haven’t gone fishing for two days. What can I do now?” he said. The C9 contamination crisis is spreading beyond the village of Xiaocuo and its impact is continuing to grow. On Thursday morning, in neighbouring Shage village, the sea also turned yellow with oil and carried a strong odour, according to a fisherman who provided video evidence. Fujian Salt Group, which has one salt production site in Quangang district and another in neighbouring Putian city, shut down its seawater supply as a precaution until the quality can be proved safe. The two sites, which produce about 30 per cent of the group’s total salt, are currently using previously stored seawater. Wu Lixin, researcher with Fujian Institute of Research on the Structure of Matter, told Science and Technology Daily that C9 was not highly toxic if inhaled. Exposure to a high concentration of C9 would irritate eyes, nose, throat and lungs, and cause headache or dizziness, according to Wu, who also said consuming contaminated vegetable or fish products carried risks of poisoning and even cancer. Chen Kaihan from Quanzhou Normal University warned the leaked C9 could have contaminated seaweed, soil, sea birds and fish and that treatment of the affected sea areas could take a long time.